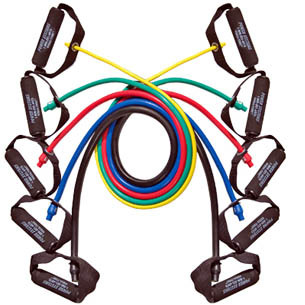 I got my resistance bands yesterday and since I woke up a little later than normal I decided to try them out instead of going to the gym this morning. I tried a few of the suggested workouts in the pamphlet that came with the bands. I can tell I need to try experiment more with the bands and find the right tension. Either it was too easy or too tough but I didnt want to wast time trying each one this morning., i will take another crack at them tonight. I also need to watch some Youtube videos to find some good exercises with them. I cant really tell if I actually got a workout from the or not. I think I prefer weights but I am not discounting the bands yet. I am willing to believe it is more operator error than anything else. In other news my first week back fitbitting and I am successful for getting my 10k steps and 5 miles or more each day. Pretty happy with that accomplishment. Was able to get all of my steps in yesterday even with having a friend over to watch a movie. If you haven’t seen John Wick you should cause it is awesome. 2nd viewing was just as good as first viewing.